The best Nexus 5x cases for one of the iterations in the Nexus series can ensure that your phone's screen and its body are free from scratches that may lead to cracks over time. These cases serve as a shield for the external part of the phone which is slippery and may likely fall easily especially when placed on certain surfaces. Moreover, the type of surfaces your device comes in contact can determine how long it maintains its sleek design. Thus, using a casing for a smartphone is a trend even in 2018. Like other flagship devices in the Nexus series, the LG Google Nexus 5X designed by LG Electronics and marketed by Google Inc has a remarkable design. Years after its release, this impressive design still makes it a competitive device with other smartphones in its range and price. But then, how can you ensure that this design is maintained and at the same time, without a significant increase in size or weight to the device? I'll tell you. 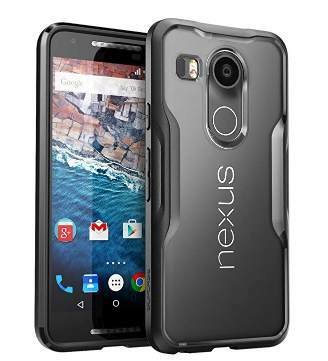 By using one of the best Nexus 5X casing which has been designed by a reputable manufacturer. Also, its build material must be durable to withstand rough surfaces that may easily mar the material. Most importantly, since it is an added layer of protection on the phone, it must have a slim build and negligible weight. With these in mind, take a look at the best 5 Nexus 5X covers outlined below. Whether you're looking for a Nexus 5x wallet case, waterproof Nexus 5x Case with a kickstand, or Nexus 5x Case with belt clip, you'll find one that meets your needs and also in your most preferred color. 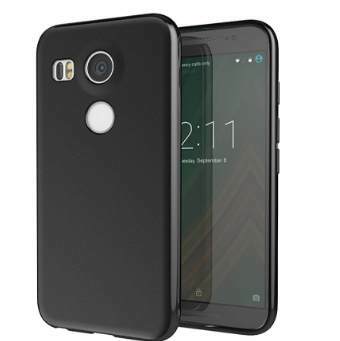 Supcase Nexus 5X case features a thermoplastic polyurethane build which helps for shock absorption and a hard polycarbonate material which acts as a scratch resistant. A combination of these materials shields the smartphone against scrapes or scratches. When the phone is accidentally dropped, the impact from its fall will be less severe thanks to this extra layer of protection. Moreover, the slim design and lightweight (dimension of 7.6 x 4 x 0.4 inches, weight 1.76 ounces ) of this cover gives users an easy access to the device's screen. The exact cutout of ports for the charger and headphone helps to maintain functionality when these external devices are plugged in. In the same vein, the correctly sized cutouts for the camera and fingerprint sensor as well as volume and power buttons enable the phone to be used with ease. 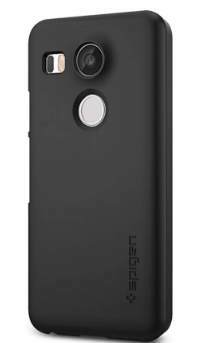 One of the best LG Google Nexus 5X cases is the Cimo [Matte] Premium Slim Fit Flexible TPU Cover. For its size and weight, it can be said to be among one of the slimmest and lightest cases for the Nexus 5X. That being so, you can still operate your smartphone with ease, carry around, and slide into a pocket. Also worthy of note, are its correct size cutouts for the microphone, camera, speakers and headphone jack to maintain the level of the device's functionality as if it were without the cover. Sporting a dimension of 5.8 x 0.4 x 2.9 inches and weight of 0.8 ounces translates into a less bulky case. You'll find a glossy back at its sides while a matte back at its back in a bid to ensure your smartphone still has a sleek and premium design. This textured design also gives it a sturdy feel allowing for a firmer grip when held, and disallowing for slips and falls from certain surfaces. One of the most reputable makers of cases for high-end devices is Spigen, and their Nexus 5x case is not one to disappoint. This case is made from polycarbonate for scratch prevention and its black variant comes with a matte coating to give users a comfortable feel and firmer grip. Thus, even though you can find this casing in various colors including blue and white, black may be your most preferred color. 2.08 ounces which makes it moderately sized. Nevertheless, you might not notice significant changes in the size and weight of your smartphone after installing this cover since it is not bulky. You'll also find raised bezels at front edge and camera which helps to protect the touchscreen and camera lens from potential harm. 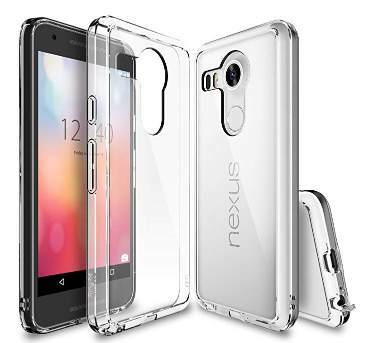 Ringke [Fusion] Clear PC BackThermoplastic Polyurethane Bumper is suitable for the Nexus 5X case majorly for its design. This is because of its clear crystal nature which makes it undetectable that a case is being used. Also, this case is suitable for your device irrespective of its color because of its transparent nature that still shows off the sleek design of your Nexus 5x. Asides its admirable design, other features that make it a good choice includes a PC portrait back panel that acts as an Anti-Static and Anti-Scratch Element. Coupled with its tight grip, this provides a protection against dirt, dust as well as scratches on the case. According to its manufacturer, Ringke, its buttons are specially designed for a more natural responsive feel when pushing the volume and power buttons. In need of a uniquely designed Case for the Nexus 5X? 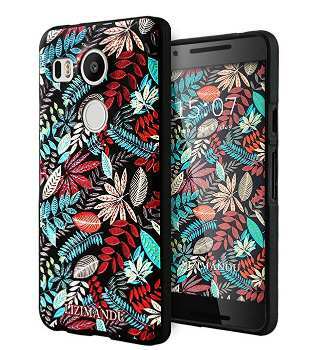 Then you may find a maple leaves textured pattern appealing as is the case of the Lizimandu TPU Texture Pattern Case. This 3d texture gives a firm grip and helps to prevent the accumulation of moisture within the case that may cause it to blur over time. Thus, its vibrant colors can be maintained for a long period of time. The dimension of this case is 8.3 x 5.2 x 0.6 inches and its weight is 1.6 ounces. For this reason, it is moderately sized and won't feel like an extra load to deal with. As part of this case, is a lid that serves to protect the screen from scratches. The exact cutout on this case provides easy access to all port, button, and camera while at the same time maintaining the level of functionality when headphones and chargers are connected. Raised bezels to protect the screen and camera lens. Shock-absorbent case to enhance the level of protection. These are the best Nexus 5x Cases in 2018 which do not only boast of a remarkable design but can provide the basic functionality for which they were acquired in the first place. That is, to protect your Nexus 5X from water, scratches, dust, cracks, and any other potential harm that may be inevitable. You can find each of these Nexus 5x Cases on Amazon, Walmart, as well as eBay and other e-commerce sites.